Ad placed in Philadelphia in 1849, before the Civil War. Baynan fears that her son, age about 15, has been kidnapped. 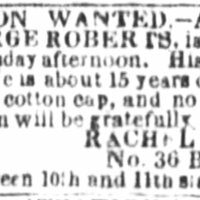 “Rachel Baynan is searching for her son, George Roberts,” Information Wanted Ad, Public Ledger (Philadelphia, PA), August 31, 1849, Last Seen: Finding Family After Slavery, accessed April 19, 2019, http://informationwanted.org/items/show/3436.